In this lesson, we will learn how to find the position of the center of gravity (or center of mass) of a set of particles arranged in a two-dimensional plane. The figure shows three weights arranged in an equilateral triangle of side length 12 cm. Find the coordinates of the centre of gravity of the system. A rhombus 𝐴 𝐵 𝐶 𝐷 in which 𝐴 𝐶 = 2 𝐵 𝐷 = 8 c m such that point 𝐴 is located in the first quadrant of a Cartesian plane, 𝐵 is at the origin, and point 𝐷 is on the 𝑥 -axis. Masses of 4 g, 3 g, 6 g, and 10 g are attached at vertices 𝐴 , 𝐵 , 𝐶 and 𝐷 respectively. Find the coordinates of the centre of gravity of the system. The equilateral triangle 𝐴 𝐵 𝐶 in the figure has a side length is 36 cm. Point 𝐷 is the intersection of its medians (its centroid) and 𝐸 is the midpoint of 𝐵 𝐶 . Masses of magnitudes 15 g, 27 g, 40 g, 12 g, and 50 g are fixed at the points 𝐴 , 𝐵 , 𝐶 , 𝐷 , and 𝐸 respectively. Determine the coordinates of the centre of gravity of the system. A square 𝐴 𝐵 𝐶 𝐷 of side length 𝐿 . Three masses of 610 g are placed at 𝐴 , 𝐵 , and 𝐷 . Find the coordinates of the centre of mass of the system. The figure shows a system of point masses placed at the vertices of a triangle. The mass placed at each point is detailed in the table. Determine the coordinates of the center of gravity of the system. The figure shows a system of point masses. The mass placed at each point is detailed in the table. Determine the coordinates of the centre of gravity of the system. An equilateral triangle 𝐴 𝐵 𝐶 of side length 4 cm. The points 𝐷 , 𝐸 , and 𝐹 are the midpoints of 𝐵 𝐶 , 𝐶 𝐴 , and 𝐴 𝐵 , respectively. Weights of 5 kg, 3 kg, 10 kg, 7 kg, 2 kg, and 3 kg are placed at the points 𝐴 , 𝐵 , 𝐶 , 𝐷 , 𝐸 , and 𝐹 , respectively. 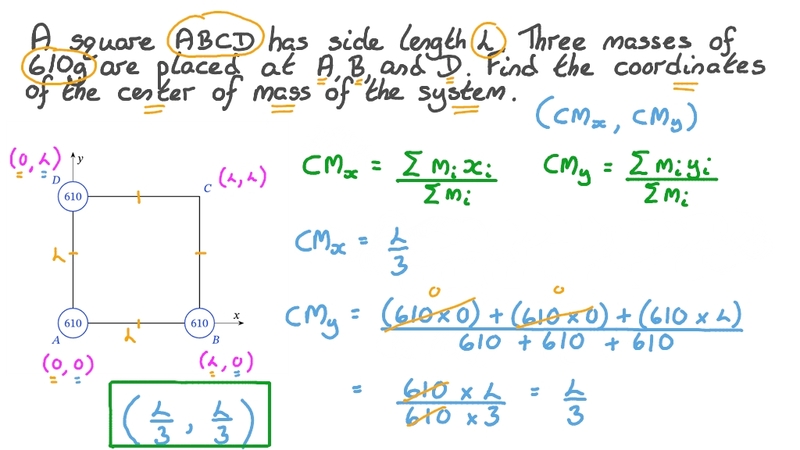 Find the coordinates of the centre of mass of the system. The figure shows a system of point masses placed at the vertices of a hexagon of side length 𝑙 . The mass placed at each point is detailed in the table. Determine the coordinates of the centre of gravity of the system. A rectangle, 𝐴 𝐵 𝐶 𝐷 , in which 𝐴 𝐵 = 2 2 c m and 𝐵 𝐶 = 2 6 c m . Four masses of 6, 7, 5, and 9 g placed at the vertices 𝐴 , 𝐷 , 𝐵 , and 𝐶 respectively. Another mass of magnitude 8 grams is attached to the midpoint of 𝐴 𝐷 . Determine the coordinates of the centre of mass of the system. Four masses of 630 g are placed at the vertices of a square 𝐴 𝐵 𝐶 𝐷 of side length 𝐿 . Determine the coordinates of the centre of gravity of the system relative to the axes  𝐴 𝐵 and  𝐴 𝐷 . A square 𝐴 𝐵 𝐶 𝐷 has a sidelength of 70 cm. 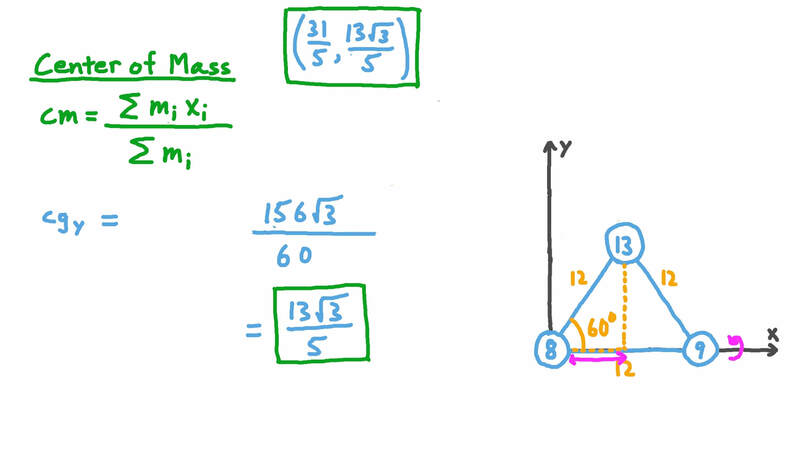 When four equal masses are placed at the vertices of the square, the centre of mass of the system is 𝐺 . When the mass at vertex 𝐴 is removed, the centre of mass of the system is 𝐺 ′ . Find the coordinates of the centre of mass of the two systems 𝐺 and 𝐺 ′ . The figure shows a system of point masses 𝐴 𝐵 𝐶 𝐷 . The mass of each point is detailed in the table. Find the coordinates of the centre of gravity of the system. A square 𝐴 𝐵 𝐶 𝐷 of side length 3 cm. Four masses of 2, 6, 3, and 2 grams are placed at 𝐴 , 𝐵 , 𝐶 , and 𝐷 respectively. Another mass of 8 g is placed at the midpoint of 𝐴 𝐵 . Determine the coordinates of the centre of mass of the system. Equal masses are suspended from six of the vertices of a regular octagon 𝐴 𝐵 𝐶 𝐷 𝐸 𝐹 𝐺 𝐻 . The masses are placed at 𝐴 , 𝐵 , 𝐶 , 𝐷 , 𝐸 , and 𝐺 . Given that the distance from any vertex to the centre of the octagon 𝑀 is 52 cm, find the distance between 𝑀 and the centre of gravity of the system of the six masses. Four particles of masses 9 kg, 10 kg, 4 kg, and 7 kg are placed on the 𝑥 -axis at the points ( 4 , 0 ) , ( 3 , 0 ) , ( 8 , 0 ) , and ( 1 , 0 ) respectively. What is the position of the centre of mass of the four particles? Four particles are positioned at the points ( 0 , 𝑎 ) , ( 0 , 5 ) , ( 0 , 1 ) , and ( 0 , 3 ) . The centre of mass of the four particles is the point 𝐺 ( 0 , 2 ) . Given that the masses of the four particles are 1 0 𝑚 , 5 𝑚 , 4 𝑚 , and 3 𝑚 respectively, find the value of 𝑎 . Two particles of weights 8 N and 18 N are separated by a distance of 39 m. Find the distance between the particle of weight 8 N and the centre of gravity of the system. Three particles are placed on a line. Particle 𝐴 of mass 4 kg is located at the origin, particle 𝐵 of mass 6 kg at ( 9 , 6 ) , and particle 𝐶 of mass 10 kg at ( 6 , 4 ) . Determine the coordinates of the centre of mass of the three particles. Three masses of 5 kg, 3 kg, and 9 kg are on the 𝑦 -axis at the coordinates ( 0 , 2 ) , ( 0 , − 3 ) , and ( 0 , − 4 ) respectively. Determine the position of a fourth particle whose mass is 7 kg that needs to be added to the system for the centre of mass of all four masses to be at the origin. The figure shows a system of point masses placed at the vertices of a square of side length 6 units. The mass placed at each point is detailed in the table. Determine the coordinates of the centre of gravity of the system. The points ( 0 , 6 ) , ( 0 , 9 ) , and ( 0 , 4 ) on the 𝑦 -axis are occupied by three solids of masses 9 kg, 6 kg, and 𝑚 kg respectively. Determine the value of 𝑚 given the centre of mass of the system is at the point ( 0 , 7 ) . Six masses of 70, 30, 70, 50, 70, and 10 kilograms are placed at the vertices 𝐴 , 𝐵 , 𝐶 , 𝐷 , 𝐸 , and 𝐹 of a uniform hexagon of side length 30 cm. Find the distance between the centre of the hexagon and the centre of gravity of the system. The figure shows a system of point masses. The mass placed at each point is detailed in the table. Given that 𝐴 and 𝐷 are on the same horizontal line, find the coordinates of the centre of gravity. A triangle 𝐴 𝐵 𝐶 , where 𝐴 𝐵 = 3 3 c m , 𝐵 𝐶 = 4 4 c m , 𝐶 𝐴 = 5 5 c m , and 𝐷 and 𝐸 are the midpoints of 𝐴 𝐵 and 𝐴 𝐶 respectively, is located in the first quadrant of a Cartesian plane such that 𝐵 is at the origin, and the point 𝐶 is on 𝑥 -axis. Three equal masses are placed at points 𝐵 , 𝐷 , and 𝐸 . Determine the coordinates of the centre of gravity of the system. Find the coordinates of the centre of gravity of the following system: 𝑚 = 3 1 k g at ( 6 , 5 ) , 𝑚 = 7 2 k g at ( 1 , 2 ) , and 𝑚 = 6 3 k g at ( − 8 , 3 ) .